The Integral Molten Salt Reactor is an MSR that makes a point of taking the KISS principle seriously: Keep It Simple Stupid. Its proponent, the Canadian nuclear researcher and engineer David LeBlanc, does not claim that IMSR is the Ferrari of molten salt reactors. But he does claim it is by far the most doable of the concepts so far. In his presentation in May 2013 for the Thorium Energy Alliance Conference, LeBlanc pointed out that R&D costs for new nuclear technology can be huge. “Proving designs to regulators can be enormously expensive.” In his remarks, he did not directly point at LFTR, but many experts believe that the inline fuel reprocessing conceived for LFTR will be a major obstacle. LeBlanc also points out he is not opposed to LFTR, and believes it is a design worth investigating. But if we want to have a start with molten salt reactors, LFTR is not the one to start with. Like the LFTR, the IMSR goes straight back to the research in the 60s and 70s in Oak Ridge, but adds the outcomes of more recent research done in Oak Ridge that have resulted in concepts for small, modular reactors, especially the SmAHTR, which is a reactor that uses liquid salt for cooling and solid fuel. LeBlanc Embraces some of the very smart design features of the SmAHTR, but prefers to combine these with liquid nuclear fuel. In his presentation at the TEAC conference in May 2013 LeBlanc pointed out that the issue at stake is not the choice for thorium. The issue is the choice for the technology of molten salt reactors. That being said, there is still a wide variety of reactor designs to choose from, each with its specific benefits and challenges. For now, according to LeBlanc, the best idea is not to aim for the msr technology that may be the ultimate in terms of efficiency – but to aim for msr technology that has the best chances of getting accepted by regulation authorities. The point is to choose for an msr that has the shortest development time. LeBlanc’s IMSR is a true molten salt reactor. It uses uranium, rather than thorium, although it will be able to use thorium as well. It can also be fueled by transuranics presently known as nuclear waste. Other than the LFTR, the IMSR is a burner, not a breeder. While most researchers focus on breeders (which create their own fuel out of isotopes not readily fissionable), LeBlanc has weighty reasons for his present focus on burners. First, he is convinced that the R&D costs, as well as the operational costs for continuous salt processing – a hallmark of the LFTR – will be much higher than most assume. Also, pure Th-233 breeders, read LFTR, involve using highly enriched uranium, which, according to many, is a non-starter on proliferation grounds. And finally, still according to LeBlanc, a burner has negligible fuel costs, has assured and abundant resources – notably low enriched uranium – is much simpler in design, can be realized with lower R&D-costs and lower capital costs. 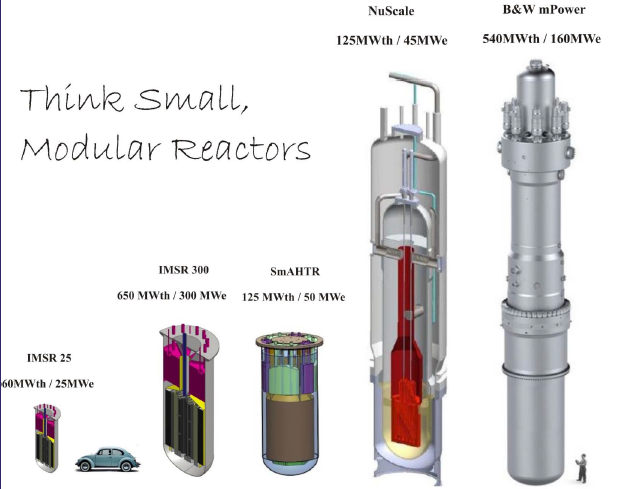 Compared to present LWR’s, today’s conventional nuclear reactor, IMSR specs are quite convincing. It uses 1/6 of the fuel used by an LWR. It employs a 7-year once-through cycle while a yearly supply of a small amount of LEU suffices. After its 7 years cycle, the accumulated transuranics can be recycled into the next batch, the remaining uranium can be recovered and only a very small fraction of the core needs to be stored for about 300 years. After this, less radiotoxicity exists in the world than before – a claim unequalled by any other reactor. What all of this adds up to is a price per kWh that is lower than for coal. In the course of 2013, investors, have noticed that LeBlanc plans add up to a simple business case. In an interview with asme.org he is quoted as having said “There has been no opportunity like this since [John D.] Rockefeller gobbled up the entire oil industry in the late 1800s.” And LeBlanc means business. He filed broad MSR-patents for the U.S. in May 2008, and international patents in November 2009. In the course of 2013, LeBlanc, in cooperation with investors and a team of enthousiastic experts from the nuclear and other industries has established Terrestrial Energy, which is presently the vehicle for the development of the IMSR. So where can we find the investors desk? Alas, LeBlanc seems to have had a lucky hand here, he does not need investors anymore. But if you want to give it a try, here’s Terrestrial’s website. Presently, Terrestrial is designing 80, 300 and 600MWth IMSR modules. The illustration compares several nuclear options, mostly to get an idea of the dimensions – technically, this illustration is not really comparing ‘apples to apples’ as LeBlanc told in a public presentation in April 2015. In the middle, we see the SMATHR, of which LeBlanc used some design principles for his IMSR, but which he considers to be too much of a compromise to be a serious contestant for a true MSR. To the right, we see two designs that present players in the nuclear industry consider ‘innovative’, but what the MSR-movement really considers as old hat technology. These are modular versions of Light Water Reactors, the conventional technology of the overwhelming majority of existing nuclear power plants. Presented are a 540MWt/160MWe module Babcock and Wilcox and a 145MWt/45 MWe NuScale module. Note the difference in ratio of thermal and electric efficiency between these reactors and the IMSR’s on the left. The LWR’s convert about a third of the energy produces into electric power. The bigger one of the two IMSR’s produces 650MWt/300MWe, which means it converts almost half of the energy into electricity – the 50% higher efficiency is due to the higher temperature, that allows the use of a more efficient type of turbine. The higher temperature also means the IMSR, and all MSR’s for that matter, are useful as a source of industrial heat. This IEEE article prominently features Terrestrial Energy’s Integral Molten Salt Reactor.